At first glance, The Yolk Café doesn’t inspire confidence: it’s the last storefront in a shopping center strip mall in Rock Hill, South Carolina. Step inside and instantly the sights, sounds and smells instill a comfort that makes you want to stay awhile. Chef Greg found a way. He deliberately created a menu with classic breakfast selections such as waffles, pancakes and potatoes with the intention of gaining customers’ trust. He hoped to entice them to try something new – break from tradition and try menu items or specials with his unique touch. Specials like the Elvis Presley Waffles with a peanut butter waffle topped with a meringue, a graham cracker pancake with Guinness whip cream or the sweet potato pancakes with bacon granola, apple caramel and pumpkin spice cream make The Yolk Café a destination for weekend breakfast. Just about everything is made from scratch - sauces, quiche dough, pancakes, hollandaise sauce, caramel and apple cider vinegar. Produce, eggs (more than 3,000 a week) and chickens are sourced locally from The Pennell Barn, Watson Farms and Rock River Farms. Chef Greg’s relationship with the farmers has made it possible for him to request specific vegetables to be grown for his use. Other traditional southern dishes with a twist are also on the menu. In There’s Fire, a biscuit and gravy dish, Chef Greg swapped out the traditional sausage gravy with a smoked chicken gravy. His Shrimp & Grits includes smoked gouda, sautéed shrimp in a jerk marinade and a scallion pesto. Chef Greg knows that great grits make this dish and uses course ground grits in a ham hock stock, an homage to his granny. He also seasons them from the very beginning. Chef Greg’s take on the classic corn beef hash is the Mojo Hash. “We are trying to figure out a way to make the absolute best of a classic or we’re trying to figure out how to take the idea of a classic and make it our own,” says Chef Greg. “I think the Mojo Hash is one of the dishes that bridges everything I know.” The base is flank steak with a chili, coffee (MoJo is Morning Joe) and paprika rub. He adds color with sweet potatoes cooked with a four-mushroom, roasted garlic oil. He tops it with an over easy egg and a scallion pesto. Early in Chef Greg’s career, before he attended culinary school in Scottsdale, Arizona, he worked at Ching’s Hot Wings restaurant in Memphis. It was there he grew to appreciate the use of seasonings. His TN fries are Yukon potatoes with the house seasoning – a favorite among new and old customers. He uses this same seasoning on his chicken. It was important to Subrina that the café have an intimate setting. The space seats 50 to 60 people in booths, tables and one long community table in the center of the restaurant. The walls and furniture are pale grays and blues to create a contemporary country look. She painted farm doors to be used as tables. “I wanted it to have the feel of being in someone’s house – like a big dining room table,” Subrina says. Subrina inserted record album covers under the tables’ glass. A variety of artists such as Jimmy Hendrix, Prince, Aretha Franklin and Outcast serve as conversation starters. When she found a magazine with their last name, Collier, she scoured thrift stores to find more and added these to the tables too. The Collier’s partnership – Subrina working the front of the house and Chef Greg handling the kitchen – works. 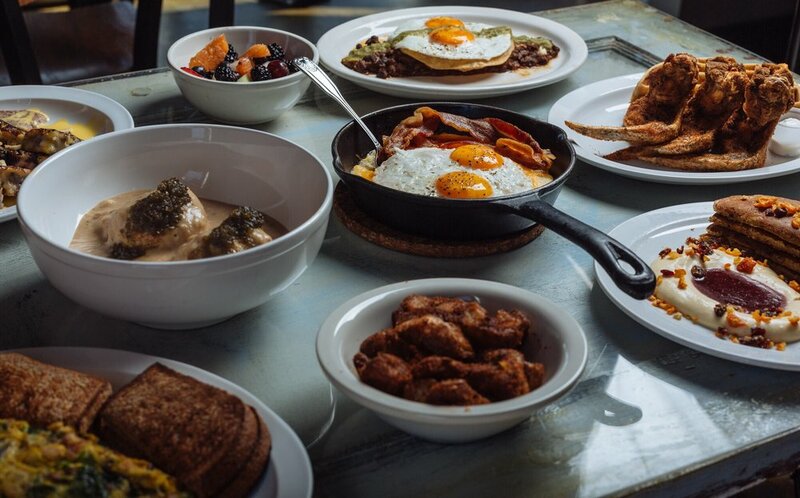 They’ve found a balance between offering a delicious breakfast in a cozy and calm setting and challenging folks to venture into unknown culinary territory just 30 minutes south of Charlotte.